We received many of these books for review purposes. As always all opinions are honest and solely my own. Affiliate links are included! 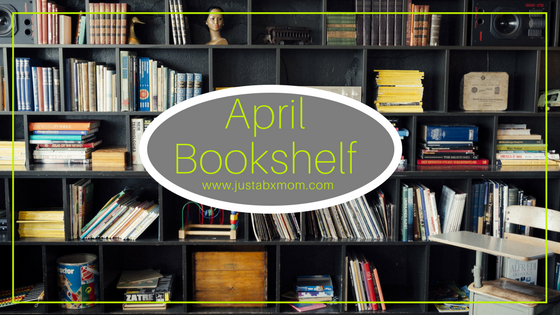 We recently cleaned out and cleaned up JustaBXgirl’s bookshelves and organized them by genres. It was a fun activity for both of us and allowed us to find books to donate to her school’s free library and her classroom. It also gave me the bright idea to rename my reading round-ups as our bookshelf. Let me know what you think! We have a lot of fun titles to share with you this month. One for you, some for your littles and some for both of you to enjoy together! When Fur And Feather Get Together – JustaBXgirl is really trying to get this rhyming thing down and she loves animals so this book was a hit in our home. I loved that it introduced new vocabulary words to her while reinforcing some lessons she has already learned in school. Screen Free Fun – This book has 400 activities to do with your children to keep them busy this summer. I think it is a great way to keep the littles from becoming glued to their screens over summer break. I know we’re looking forward to trying them out soon. My godson is going to have fun with the Shoe Box Trains. And I know JustaBXgirl will enjoy crafting cereal necklaces because who doesn’t want to accessorize with a snack! Liktoon & Ge’s Adventures – Liktoon’s Boat– If you’ve followed me for a while then you know I believe in teaching littles about financial literacy. This book introduces concepts around earning, saving and much more. It also delivers the lessons in a fun way that doesn’t feel like a lecture. We can’t wait to go on more adventures with Liktoon and Ge. Look, See The Farm– This book is beautifully illustrated and is another that introduces new vocabulary to JustaBXgirl. It also introduces her to different types of birds. It is a great way for my city girl to learn bird watching and about the importance of choosing organic! We might not be heading to a farm anytime soon but it was fun to tag along on Kelsey and Avery’s visits to their grandparents’ farm in this book. A Wrinkle In Time -I don’t think anyone is surprised to find this on our bookshelf and I’m betting most of you have it on yours. I can say though that I was excited that JustaBXgirl herself asked to add this to our reading list. We also still have to go see the movie. The Tukor’s Journey– JustaBXgirl loves books about adventures. This has everything she loves. Mystery, adventure, action and, family. I only hope that when she can read by herself she still picks up books that can transport her on adventures like this one does. Don’t Ever Look Behind Door 32– This is another great rhyming book. It is so much fun and wait for it….gets your littles counting and I’m not talking just to ten. I’m not sure how they came up with all the rhymes, pictures and ideas but the book goes all the way up to 32. We are big Hotel Transylvania fans so this book was lots of fun for us to read since it takes place at a scary not so scary, creature-filled hotel. The Cactus– This book is a great reminder that no matter how much we might plan and organize our life we truly have no control. Life is going to happen to us and all we can do is continue to bloom through it all. I love the reminder on the cover that it’s never too late to bloom.